This review originally appeared in the January 2007 issue (#221) of The New York Review of Science Fiction. Where I come from we don’t have castles, cairns, holy wells, or standing stones. Seeing them for the first time, they looked completely different from how I’d imagined them. I realized then that this is why so much of the best fantasy comes from the British Isles, and why so much American fantasy is so bad. Their writers grow up with ring forts literally in their back yards sometimes, while ours grow up reading their books. New York, NY: Bantam Books, 2005; $12.00 trade paperback; 416 pp. Although the text is from his Guest of Honor speech at Finncon 2003, this is a sentiment I had heard Swanwick express at various book readings and signings previous to that convention. He also added that this, in part, served as an inspiration for Iron Dragon’s Daughter and helps to explain why its tone differs greatly from a large number of fantasy novels. Although that type of detritus is missing from much of America’s countryside and we lack an ancient mythology that ties a plethora of gods to our land, America does possess a different type of ruins and a much younger mythology—ones differing from the industrial modes Swanwick relied upon—that writers can tap into for uniquely American fantasy. 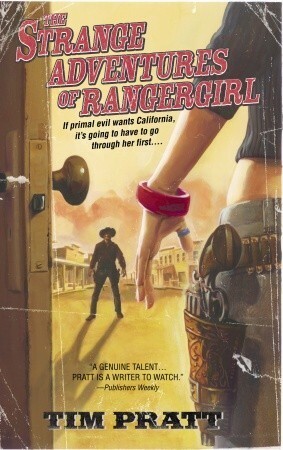 With legends surrounding real-life figures, as well as ghost towns and abandoned mines scattering the countryside in its wake, the wild west of the 1800s provides another vein for American fantasy to mine, which Tim Pratt taps into in his debut novel, The Strange Adventures of Rangergirl.